From the files of The Gazette February 6, 1997. An election was scheduled for the Newfoundland House of Assembly on Nov. 6, 1893. The incumbent premier and leader of the Liberal Party, Sir William Whiteway, pitted his record of the past four years against the Conservatives, led by Walter Baine Grieve and Moses Monroe. Whiteway offered such incentives as road grants and railway construction, while promising to keep the public debt in line. The Conservatives were seen as the party advocating confederation with Canada. The campaign was somewhat par for the course in 19th-century Newfoundland, with mudslinging and underhandedness as the operative words. D. W. Prowse (1895) described it as an "indecent carnival of scurrility." The result was a vote of confidence for Whiteway, with the Liberals winning 23 seats to the Conservatives' 12, and one independent. The Conservatives, however, were convinced that the people had been unfairly influenced by the Liberals with promises of work for those who voted for them. On Jan. 6, 1894, the Conservatives filed petitions in the Supreme Court, under the Corrupt Practices Act, against 15 of the Liberal winners and independent member James Murray, charging them with bribery and corruption, and advocating their dismissal from the House of Assembly. The members so charged were all brought to trial, and as they were heard by electoral district it was well into summer before all the trials were conducted and the verdicts rendered. All members charged were found guilty, had their seats declared vacant, and all but one (James Watson in Trinity) were barred from running again for election to the House of Assembly. The artist's signature is not readily identifiable. Courtesy of Archives and Special Collections (MF - 339), Queen Elizabeth II Library, Memorial University of Newfoundland, St. John's, NL. During the trials, on April 3, 1894, Premier Whiteway asked Governor Sir Herbert Murray for a dissolution of the House of Assembly and a new election. When the governor refused, Whiteway resigned, and the Conservative leader, Augustus F. Goodridge, was invited to form an administration. He agreed to try, despite the fact that his party held only 12 seats to the Liberals' 21 (two Liberals had already had their trials, and their seats had been declared vacant). At that time in Newfoundland, when a person was appointed to cabinet he had to resign his seat and run in a byelection, in order to show he still had the confidence of the electorate, as he would now be receiving an increase in salary from the public treasury. Therefore, the five members of the House of Assembly whom Goodridge appointed to his cabinet had to resign, bringing the Conservatives numbers down to seven. Throughout the summer, more and more Liberal seats became vacant (two by-elections were held in May), until by August, when the trials were over, the standings in the House were Conservatives: 8; Liberals: 9; and 19 seats vacant. Meanwhile, the governor kept proroguing the House of Assembly, enabling Goodridge to remain in office and preventing him from having to face motions of no confidence. Byelections were held throughout the fall. Almost to a man, the Liberals retained the seats they had been disbarred from, losing just two, while picking up two from the Conservatives in return. The last byelection was held on Nov. 12, 1894, a full year after the general election. In the interim 21 byelections had been held, resulting in a virtual return to the status quo. Goodridge remained as premier until Dec. 12, 1894, two days after the Bank Crash which crippled the Newfoundland economy. Daniel J. Greene, acting Liberal leader, was sworn in as premier the next day; he met the House of Assembly and arranged for passage of the Disabilities Removal Act, which allowed all those members who had been disqualified to once again offer themselves as candidates. Greene then handed the premiership back to Whiteway, and several members of the Liberal Party resigned their seats to make way for Whiteway and members of his administration to gain election to the House of Assembly. Six more byelections had to be held, a total of 27 since the previous general election, all won by Liberals. The more things changed, the more they remained the same. At a recent auction held in St. John's, offering items which had been collected by Nimshi Crewe (1901-1971), the archives was fortunate to be able to acquire the drawing pictured at left. It is captioned "The Newfoundland Election Trials: Mr. Justice Little Delivering Judgment." On the bench at the left are Mr. Justice Joseph I. Little, Chief Justice Sir Frederick Carter and Mr. Justice James S. Winter. 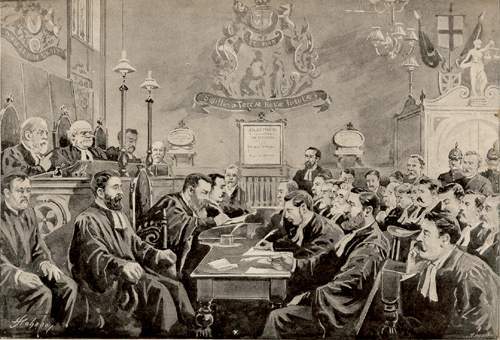 Facing them on the right side of the centre table are Sir Robert Bond, James Watson nd Sir William Whiteway, the three members for Trinity, who are listening to Mr. Justice Little deliver the verdict. The date is July 25, 1894. Whiteway and Bond were found guilty of bribery and corruption, unseated and disqualified from running gain; Watson was unseated, but not disqualified. Lawyers, court officials and members of the public, some of whom are easily recognizable, fill out the scene. The drawing appeared in a British newspaper, probably The Illustrated London News; the artist's signature, in the left hand corner, is not readily identifiable. It is one of few, perhaps the only illustration of the trials arising from the infamous "Election Petitions of 1894." Incidentally, after this blot on their characters, Whiteway continued as premier until 1897 and Bond became premier in 1900, remaining in office until 1909.